November 6, 2013 November 8, 2013 / Julie Brook, Esq. Want a great discovery organization tip? Create a calendar of all the relevant discovery dates. This will help you evaluate what discovery you’ll need and schedule it in relation to the relevant statutory deadlines. date for the demand for exchange of expert witness information. Note that under California’s delay reduction rules, courts won’t continue trial dates because discovery hasn’t been completed. So, make sure to plan your case so that you don’t run out of time to conduct necessary discovery. Trial Court Delay Reduction Deadlines. Develop a calendar that allows you to complete your discovery within the deadlines established by the court’s case management plans. Other Statutory Deadlines. Calendar the last day for discovery and discovery motions with an eye to any relevant local rules. See CCP §2024.010. Stipulated Deadlines. 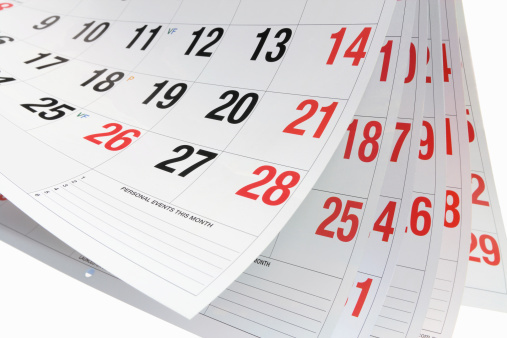 Calendar any discovery deadlines that you have agreed to with other counsel. To create your discovery calendar, list important court-required dates and then count backwards to develop a discovery timetable based on the discovery methods in your plan, their purposes, and your schedule for initiating them. Estimate additional time needed for any court-ordered further responses. After the initial creation of your discovery plan, periodically reevaluate it in light of information you receive in response to any discovery request, as well as information you get from investigation. You may need to alter your discovery plan and calendar any revised dates. For example, if you learn the name of a new witness from answers to interrogatories, you may need to take the witness’ deposition. If your case is set for arbitration and all discovery (except for experts) has to be done before the arbitration (see CCP §§1141.24, 2024(b); Cal Rules of Ct 3.822(b)), you’ll need to revise the discovery deadlines accordingly. The best idea for discovery (as with most things in life!) is to complete it well before the deadlines. Although your discovery calendar will list all the deadlines, don’t wait until you approach a deadline to start working on a particular discovery requirement. Plan well in advance, start early, and finish early. For everything you need to know about discovery plans, including help with deciding which discovery methods to use and how to plan the sequence of discovery, turn to CEB’s Creating Your Discovery Plan (Action Guide). Also check out CEB’s program Discovery: Creating Your Plan; Propounding & Responding to Discovery; Handling Objections, available On Demand.